Sangria de Cava La Petarda - based in Barcelona - have created the first bottled Cava Sangria on the market. A great option for any special occasion from a romantic night in to a dinner party or wedding. 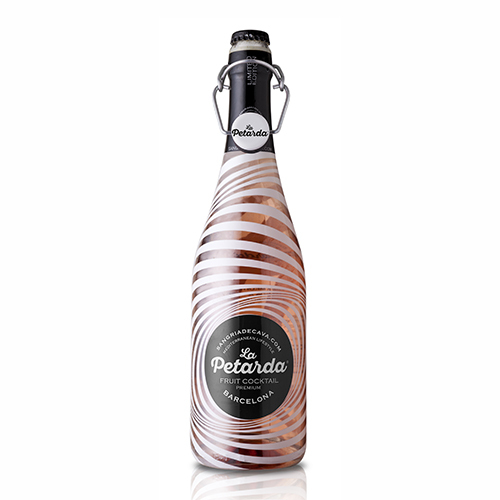 Every special occasion calls for a bottle of Petarda. The perfect accompaniment for appetisers and cocktails. It is superb with salads, white meat, fish seafood and deserts. Sangria de Cava La Petarda is a cava based product made with Garnacha grapes. Tasting notes: Pale pink, seductive and moreish. The aroma is delicate with notes that recall rose liqueur. In the mouth it is subtle and elegant. La Petarda is wonderfully fresh and meant to be enjoyed immediately. Best served very cold (6 degrees) with seasonal red fruit. Cava-based product made with black Garnacha grapes using the Charmat method. We add concentrated flavours into the isobaric machines to maintain the carbonic action during a secondary fermentation.